Wow Factor! Show Stopper Home That Really Sticks Out Among All Others. Over 250K Spent In Upgrades. Extra Wide Double Door Front Entrance. Hardwood Floors, Pot Lights, California Shutters Throughout. Spacious Living, Dining, Kitchen Area. This Home Boasts Open Concept. Large Modern Kitchen With Upgraded Appliances, Floor To Ceiling Cabinets And A Huge Island. 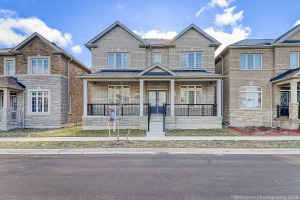 Stunning Finished Basement With Family/Game Room, Bedroom And A Washroom. Close To Hwy 407. S/S Fridge, Stove, Hood Fan, Microwave, Washer, Dryer. All Electrical Light Fixtures. All Window Coverings. Fireplace. Custom Closets. Beautiful Stone Patio Out Back To Enjoy The Summer Weather. State Of The Art Security System. Hwt Rental.